I am sure when we talk about pasta; it is one such thing that is loved right from children to the adults in each and every home. Pasta is generally made from durum wheat flour. Durum in Latin means ‘hard.’ The protein content in the durum wheat is high and hence, the dough stretches very well. Traditionally, pasta is made without addition of any water. Only eggs are used to knead the dough and it is kneaded with hands. Today, we have bigger machines in which pasta dough is kneaded. Many hotels use imported refined flour and semolina to make the pasta instead of durum wheat. To make eggless pasta, eggs are replaced with water. The ingredients that traditionally make the pasta dough are flour, eggs, salt and olive oil. The procedure goes somewhat like this: the pasta dough is made and then it is passed through a pasta machine. The machine rolls the pasta dough evenly. The attachment has different thicknesses and you can adjust the thickness of the pasta accordingly. There are attachments for different shapes of pasta as well. Once your dough is rolled, you need to pass the dough through different attachments depending upon the choice of the shape. When the pasta is made in the factory, it is passed through big dough sheeters that roll the dough into desired thickness. It is then passed through different moulds to get the desired shapes. The pasta is then dried in an electric dryer. The temperature of the dryer is maintained at 65°C. Pasta is categorized into Distinctive Shapes. Nowadays, pastas are made with different natural colours. The green pastas are normally made with spinach chlorophyll. The red ones are made from tomato paste or puree. The black pasta is made from squid ink. Today, the whole wheat pastas are also available in the market. Parmesan cheese, garlic, pine nuts and olive oil. 2. Bolognaise sauce: minced meat and tomato based sauce. 3. Carbonara sauce: the main ingredients are eggs and bacon. 4. Napolitana sauce: tomato and basil based chunky sauce. 5. Aglio olio: garlic and olive oil based sauce. While cooking pasta, make sure that you have a deep pan of boiling water. Add salt and oil to the water. Salt is added initially so as to season the pasta before it is being cooked along with the sauce. If you do not add salt to the pasta water, it will be very difficult for you to adjust the salt level later in the sauce. The oil is added so as to avoid pasta sticking to each other. The pasta is put into the boiling water and is boiled for ten to twelve minutes depending on the time mentioned on the packet of the pasta. The pasta should always be cooked al dente or to the bite as the Italians say. It is always advisable to cook the pasta a minute or two less than the time mentioned on the packet. It can be cooked further along with the sauce. However, the Indians prefer their pastas a little bit more cooked than al dente. Once you boil the pasta, drain the water. Spread the pasta on a tray if you are not going to use it immediately. Sprinkle some olive oil and keep the pasta aside till further use. Fresh pasta takes much less time to cook as compared to the packet pasta. Fresh pasta is generally made and frozen in batches. Plunge the frozen pasta in a pan of boiling salt water and it will get cooked within two to three minutes. We Indians prefer our pastas with much more sauce than is normally served in Italian restaurants. Chilli flakes is a very common ingredient used in Indian versions of pastas. If we look at Indian food, dal dhokli which is a Gujarati delicacy can be considered as a type of pasta. Dough is made from whole wheat flour and gram flour (besan). It is then rolled out, cut into stripes and cooked along with dal. One of the unique pasta dishes that I had made happens to be of the ‘Pasta Cake’ which I did while doing a cookery show. I tossed the pasta with some tomato sauce, added some white sauce and baked in a cake tin. Pasta is not only limited to authentic Italian food, but it can also be used in different stews, soups and salads. Here are a few recipes that you could try out at home. Everything’s fair in love, war and…chocolate! Yes, everything is fair when it comes to this sinful, yet so lovable thing called “chocolate.” As far as I know, I haven’t seen or met anyone who does not like chocolate, in one or the other form! To be true, I can have dozens of chocolates, but just don’t have them so often for health sake and even if I end up gorging, I make sure to run that extra mile to burn it. This is the reason, why I had to come up with a book which was all dedicated to this incredible ingredient – aah! Chocolate is out on stands now, and I’m sure if you get it, you will definitely not regret! From being one of the most popular flavours in the world to an aphrodisiac, chocolate surely is sinful in the truest sense! Rightly termed as the wonder ingredient, who knew that the discovery of an ordinary bean from the tree Theobroma cacao found in the jungles of South and Central America would become a hot favourite of all ages around the world. The cacao plant, from which the cocoa powder is made, is said to have originated in the Amazon area of South America in 2000 BC. The earliest record of chocolate being consumed as a beverage, dates from over 15000 years ago in the rainforests of Central America, where conditions for the growth of the cacao tree were perfect. The Olmec, one of the first civilizations in America, are believed to have been the first to grow cocoa beans as a domestic crop. The cacao tree was held in high esteem by the Mayan civilization and by AD 300 cacao was used in ceremonies to celebrate life and fertility. Evidences of cacao pods have been found in the carvings remaining on temples and palaces. Later, archeological finds have included whole cacao beans and wood fragments from the cacao trees in Guatemala. Vessels found to come from around 600-400 BC in Belize and 1100 BC in Honduras have been found, on scientific examination, to contain residue of theobromine and caffeine, which are both contained in cacao beans. Cacao is named in text on one of the vessels, which had a stirrup handle and a complicated locking lid. There are several mixtures of cacao described in ancient texts, for ceremonial and medicinal uses, as well as culinary purposes. It was used as a remedy and a way of delivering other herbal medicines. The cacao beans were roasted and pounded with chilli and maize for added flavour and then mixed with water. The bitter, unsweetened mixture was left to ferment and was originally reserved for ceremonies and for drinking by the rich, influential and religious elite. Women prepared the brew but, usually, only men drank it, as it was considered too strong or possibly even toxic for women and children. Some mixtures included maize, chilli, vanilla, peanut butter and honey. Chocolate was also mixed with a variety of flowers, and sometimes it was thickened with corn gruel to make a kind of porridge. There’s a white counterpart of the rich, dark brown chocolate called ‘white chocolate’ that is nothing but cocoa butter along with sugar, milk powder, vanilla and the emulsifier lecithin. One thing to keep in mind while buying a good white chocolate is to make sure that it contains cocoa butter as some inferior brands contain vegetable fats. This rich, creamy, sweet and subtle-flavoured chocolate makes it best suited for baking purposes as it complements other ingredients. This chocolate is very delicate and thus, should be always melted on very low heat in order to avoid burning. Also while setting, it happens to be softer than the dark chocolate as it contains milk solids. Melt thy chocolate – right! Have you ever experienced that while melting chocolate in a double boiler, the steam from the pot under the bowl gets into the chocolate and solidifies it? The chocolate is ruined isn’t it? Let us see what causes this and how can we repair the damage. Chocolate has many moods! Sometimes it melts to a satiny pool of liquid chocolate and sometimes it becomes a grainy mess. Chocolate while being melted simply cannot tolerate small drops of water. In this case, the steam escaping from the bottom of the double boiler is sufficient to put the chocolate in trouble. The same thing will happen if you cover the pan in which chocolate is melting. Then moisture condenses on the inside of the lid and drips down on the melting chocolate with the same result. Once chocolate has solidified it is not easy to coax it back to liquid form. When melting chocolate, make sure the water in the bottom of a double boiler is hot, but not boiling. Or consider melting chocolate in a very heavy saucepan with a metal ring placed on the element to insulate it from direct heat. Or better still melt it in a microwave oven. Store thy chocolate – right! Improper storage causes ‘bloom’ (discolouration) in the chocolate, which could be one of the two substances: it could be cocoa fat that rises to the surface of a solid chocolate mixture that is stored for too long at room temperature, or it could be sugar that is drawn to the surface by the condensation of a loosely wrapped, refrigerated chocolate mixture. The moisture extracts sugar from the mixture’s interior. Although it might look a little less appetizing than a lustrous, rich chocolaty-brown piece of sweet, chocolate that has suffered bloom is still okay to eat! You may find the texture of sugar-bloomed chocolate to be a bit grainy on the outside, but it should still taste good. To prevent this from happening to your chocolate, simply use proper storage methods. Since chocolate can easily absorb flavours from food or other products stored alongside, chocolate should be tightly wrapped and stored away from pungent odours. The ideal temperature for storage is somewhere between 18°C-20°C. If stored properly, you can expect milk chocolate and white chocolate to be good for up to six months. Other types of chocolate can have an even longer shelf life. •When melting chocolate, make sure all the equipments are completely dry. Any moisture in the utensils/container may cause the chocolate to stiffen. To rectify the error, stir in half to one teaspoon of melted shortening for every ounce of chocolate. •In order to minimize the cooking time, chop chocolate bars into squares or smaller pieces before melting them. •Chocolate melts easily in a microwave and there is less danger of scorching. •Store grated chocolate in the freezer. It is easier to work with frozen chocolate, since you can scoop out as much as you need. •White or milk chocolate make better chocolate shavings because they are a softer chocolates and will curl better. •While melting chocolate add a spoonful of butter to the chocolate for a smoother consistency and richer flavour. •To prevent your chocolate cake from having white streaks on the brown crusts, dust greased cake pans with cocoa instead of flour. •For bananas that are ripe and ready to eat but you have too many, peel the bananas and freeze them then dip in melted chocolate and freeze again, this makes a nice treat! •Have a bag of chocolate chips in hand? Just sit with the whole bag in a bowl of very hot water, and mush the bag up every couple of minutes until all the chocolate has melted and there are no lumps. Snip the corner of the bag and squeeze out the melted chocolate directly onto the cake. •When you are looking for dark cooking chocolate remember that it can be available as pure unsweetened chocolate under the name of bitter chocolate or baking chocolate. •When making chocolate cake, add dried and powdered orange peels for yummy taste. •Never use a wooden spoon to stir chocolate because it adds unwanted moisture. And in the end, I have made pizzas with chocolate and fruit topping and many times I have also stuffed the favourite samosas with chocolate. Pair it up with almost anything and everything, and still you will have a surprise to yourself! Such is the marvel of this super ingredient. As for now, try some dishes like Chocolate Kheer, German Chocolate Cake, Peach and White Chocolate Cake, Chocolate Rice Pudding, choco-coconut Laddoo’s from my website www.sanjeevkapoor.com and enjoy those chocolaty moments! Some years ago, when my daughters were still in their pig tails, they used to demand to be taken to the nearest fast food joint at least twice a week, where it was customary to order for bowlful of French fries along with burgers. Now of course, as they are in their teens, they have become weight conscious and these outings have become few and far between. I am sure most of you are sailing in the same boat. Not only children but even adults like us love to eat French fries. Little wonder then that French fries with burgers, wraps and soft drinks top the menu at all Fast Food joints. Many brands sell their French fries along with different dips like cheese, mayonnaise, Sichuan sauce. Some brands even sell flavoured French fries. They have masala fries, salt and pepper fries, Italian spiced french fries, Mexican french fries which are normally served with a tomato salsa. All that is really yummy yet we would still want to be sure about the quality of food our children eat outside, don’t we? And why not… so let us explore how to make them healthier. French Fries are something that can be easily prepared at home. Homemade food, as we all know, is anytime better as compared to what our children would get to eat outside. To make French fries at home, the first thing to do is to shop for non starchy potatoes. Non starchy potatoes are also called new potatoes which have less amount of starch as compared to old potatoes. Now you may well ask why we need to use non starchy potatoes to prepare French fries. It is because when the starch is exposed to heat, it breaks down into glucose, which is a form of sugar. Sugar when heated caramelises and turns into golden brown colour. Since the quantity of starch is less in non-starchy potatoes, it takes time for the starch to break down into glucose, and the potatoes do not turn brown very fast and remain crisp. Peel the potatoes and cut them into even sized fingers. These days you get cutters which give you even sized fingers making your job less laborious. Plunge them in salted boiling water and boil till they are half cooked. Drain them thoroughly and pat dry on a kitchen towel. Once completely cooled, divide them into portions and pack them into separate zip lock bags and freeze. I said pack into separate bags so that whenever you want to use them, you can take out just as many as you want. Do not thaw them, just take them out of the zip lock bags and fry in hot oil. As simple as that but do it in batches, because overcrowding the frying pan with too many fingers at a time, will bring the temperature of the oil down and the fingers will become soggy and limp instead of crispy. You can make potato wedges too in similar manner: cut the potatoes into wedges, keep the skin intact. Parboil the wedges in salted water. Drain and put them on a kitchen towel to dry off excess water. Roll in seasoned refined flour and freeze for 6-8 hours. Just before serving, take them out of the freezer and deep fry in hot oil. You can even bake the wedges to make them healthier. Nowadays frozen French fries and potato wedges are easily available not only in the supermarkets and even in smaller shops. 100 grams of French fries contain 327 calories and that is quite a bit considering you cannot stop yourself with just that much. However you can have them occasionally without much guilt pangs. Well after gorging on them, run a mile or two more so as to burn off the excess calories consumed. Well there is some good news for you. These days, air fryers are easily available in the market, which consume 80% less oil as compared to deep frying in the conventional way. All you need to do is brush the food with a little oil, place them a basket that fits into the body of the fryer and adjust the temperature depending on the food you want to cook. The food gets cooked in hot air and hence a boon for the health conscious. I use it frequently and gorge on the supposedly fried goodies without feeling guilty. Recently while doing a live show, I came up with an innovation. I made fries from sweet potatoes instead of using regular potatoes. I used oil spray to spray a little oil on the fries and baked them in preheated oven till crisp. Tossed them in chaat masala, red chilli powder, some salt and a dash of lemon juice, I served them with great flair and believe me they were super hit. So learn how to make the basic recipe of fries and then sky is the limit. You can then serve them with a variety of dips and sprinklers and see them disappearing faster than you prepared them. Bingo! Frankly speaking Valentine’s Day in India is a recent age phenomenon and an after effect of globalization, and a very good marketing opportunity. But how many of us know why this day is called thus? Well Valentine’s Day celebrations began in Rome in 269 AD in memory of St. Valentine. He was imprisoned for performing marriage ceremonies of couples, which was a taboo according to a law set by the king of Rome. During this time he fell in love with the daughter of his jailor. Before he was executed he wrote a letter to her and signed it “from your valentine”, which went on to become a tradition. Since then Valentine’s Day is celebrated as a day of love all around the world. Valentine day preparations begin weeks in advance. Obviously, because no one wants to be the cause of their partner’s displeasure. Normally, you don’t need to spend money to show someone your love but on Valentine’s Day this statement does not really hold true. Prices of certain commodities sky rocket with chocolates and flowers being the most coveted items. Red roses, which are considered as a symbol of love, are sold at double the normal price! Making a restaurant reservation should be done well in advance. Since 14th February is the universal day of love, you will see so many couples tying the knot on this day. Gift shops are the most crowded shops in the mall with people buying tokens of their love ranging from life sized soft toys to precious little platinum rings. These are some of the typical Valentine’s Day traditions. But things are not so stereotyped any more. You will see a large number of people opting for more off beat things, like couples going twin bungee jumping (jumping off a cliff with someone you love could be kind of romantic) or joining a salsa dance class together. Valentine’s Day may reduce your bank balance to an extent, but all the festive goodies are sure to increase your weight quite a bit! So do make sure you take good care of your health, avoid fats and oils and carbohydrates, and stay away from too many chocolates. If you must eat chocolates, dark chocolate should be the preferred option. And if you do feel like indulging yourself on this romantic day, make up for the excess by jogging a little more, or running a mile more or walking a little more. You have to burn the extra calories you have consumed. Remember that staying healthy and fit will always be the trend. A healthy heart is a happy heart. If you plan to cook a meal for your loved ones, make sure it is nutritious. Use fresh ingredients and cook with your heart and soul. Cooking is like love, it should be entered into with complete abandon or not at all. It’s not always about what you are eating, it’s about who has prepared it and how. No wonder maa ke haath ka khaana is always delicious! Like they say a way to someone’s heart is through their stomach. Right? I am one of those people who consider it as any other day for I do not believe in symbolisms. I won’t be giving gifts to anyone. I will just spend the day doing something I love, with the people I love, my mother, my wife and my daughters. They are all foodies, and I am more than happy to cook for them whenever I get a chance to. It sounds rather simple, but it is not that easy. The four women in my life have very different choices when it comes to food. My mother is a pure vegetarian, so I will cook for her a vegetarian meal, maybe something that she used to prepare for me when I was a kid, that will surely widen her smile. Alyona on the other hand, loves seafood, so I’m planning to make some seafood phad thai, it’s quick and really tasty or Pepper Rawas Tikka. For my daughters the menu is pretty much fixed, Chicken Pasta. Every time I step into the home kitchen, which does not happen a lot these days due to my busy schedule, I am expected to make a chicken pasta and I do it with great joy. For dessert I’ll be making Chocolate Baked Yogurt, which is as healthy as it is tasty. Preparing a meal for my family, who are also my toughest critics and watching them enjoy the meal is one of the most rewarding experiences in the world for me – as a son, a husband, a father and a chef! Nothing can come close to a special home cooked meal, the company of your loved ones and conversations that never seem to end. I am sure my day is going to be very special if everything goes as planned. Valentine’s Day is a just a reason or a special chance you get to celebrate love, but also remember that each day in your life is a gift, a gift that you share with the people you love and who love you back. Try and make tomorrow more special than today, take chances, follow your dreams and tell the people in your life how much they mean to you as often as possible. Love should be unconditional. You run after it and it will run away from you. Just keep doing what you love and have faith in yourself, you will be rewarded just like I have been by the love and good wishes from the millions of fans around the world. Wishing you all a happy Valentine’s Day. Celebrate with these Valentine’s Day special Recipes. Want to know what was packed in my tiffin box today? Alyona had packed delicious Punjabi kadhi, paneer and vegetable jhalfraezi, nachni ki rotis, brown rice, salad and yogurt. Wholesome and completely satiating. What did you have in your tiffin box? Now before I go further let us dissect the word ‘tiffin’ which leaves a lot of people wondering what it actually means. When I was researching for my book on ‘Tiffin’ recipes, I found that the word tiffin was derived from the English slang tiffing. This word is now obsolete but it means ‘taking a little drink or sip’. In the present day it takes on a different meaning and pertains to food. I further found that the word ‘tiffin’ as we understand now, originated in British India when the Indian custom of having light snacks replaced the British practice of afternoon tea. The wafer thin cucumber sandwiches and cookies that were served with the very British cup of hot tea in delicate china cups were replaced by mathris, samosas, chewda and the like. In South India tiffin is generally used for in-between-meal snacks which include dosas, idlis, medu vadas etc. So they have tiffin for breakfast in the mornings and tiffin in the afternoon too accompanied by cups of hot frothing filter coffee. However in other parts of India, including Mumbai, the word mostly refers to packed lunches that school children carry to schools or working people take to office. When my daughters started full day school, Alyona would pack two tiffins for them – one for the short break and one for the long break. The one for the short break would be a smaller one in which she would pack sandwiches or biscuits or dhokla or khandvi or aloo tikki or some similar finger food. In contrast the other one would have wholesome foods like roti-sabzi rolls or some pulav or a pasta or some stuffed parantha or foods such as these. It really was some task for her, for the children expected something different every day. It was natural too for their friends too looked forward to their tiffin boxes. How do you pack tiffins? Tiffins can be packed variously: for example sandwiches can be packed in aluminium foil or in zip lock bags; you get airtight plastic boxes which are also leakproof besides being usable to reheat in a microwave oven. These days you get compact hot cases which keep the food hot. In Mumbai there is this unique system whereby you need not carry your lunch with you. Tiffin dabbas are delivered at various destinations by around five thousand odd dabbawalas and they have been doing this without a break for over 125 years now. They deliver nearly two lakh tiffin dabbas everyday and that too on time. Their exceptional management and operational models have become subjects of management study in global business schools. It is a matter of pride that the dabbawalas have a Six Sigma quality certificate and a global business fan club that includes Prince Charles and Mr. Richard Branson. Did you ask what’s so unique about this? First of all the dabbawalas are semi literate and have no formal education in management strategies. And yet the dabbas are picked up from various homes and delivered to workplace on time. Lunch over, the dabbas are once again collected from various offices and reached to their homes before the sun sets. Furthermore what is surprising is that a dabba is collected by one dabbawala and delivered to its destination by another and rarely is there any mix up. How do they manage to do this? It is because of wonderful teamwork and the way the team members manage the logistics with fabulous technical efficiency. The way it works is really difficult to comprehend by people like us who sit in the offices and expect their lunch dabbas to be delivered to them on time. To better understand how they manage this I spoke to a dabbawala who delivers a couple of dabbas at our office. He explained thus: the dabbawalas provide the dabbas which are marked with a colour-coded notation which helps them to identify its owner and the destination where it has to be delivered. Once the dabbawalas collect the dabbas, they travel to the nearest railway station on bicycles, then board the train and reach the station nearest to the destination. There the dabbas are sorted out for area-wise distribution and then delivered. This way a single dabba change hands three to four times. In our office lunch hour is like a merry picnic. Tiffin boxes in different sizes and shapes come out and all of us sit at the same table, eat from our own dabbas as also from others’ amid lot of chatter and laughter. In fact whenever I am out of Mumbai I miss this wonderful hour of pleasant camaraderie for it also gives us the opportunity of tasting and learning new recipes. What to pack in tiffins? What kind of foods can be packed in the tiffin box? Anything that your child wants or anything that you wish to have at work. It can be a complete meal or it can be a compact meal like roti-sabzi or sandwiches or idli-chutney or vegetable upma or….the possibilities are many. But let me give you a suggestion that is based on my personal experience. When you pack your tiffin box, pack at least two portions or you may not get anything. Your colleagues would like to taste your food too, you see. Same is the case with your children – kids often look forward to eating from their friends’ boxes. So you see you can make the tiffin a many splendoured one. Just let your creative imagination take over your kitchen and ladle out delicacies that will please everyone. 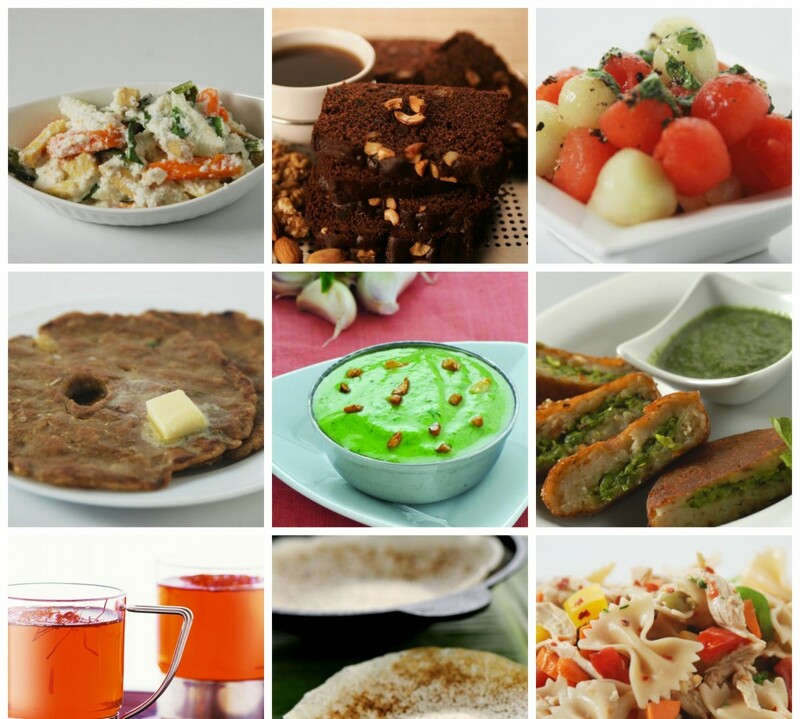 Here are some great tiffin recipes….